Layer ranch dressing, sour cream, shoestring potatoes and more for this Loaded Shoestring Potato Casserole. Top with everyone's favorite: bacon! Mix cream cheese, soup, sour cream and dressing until blended. 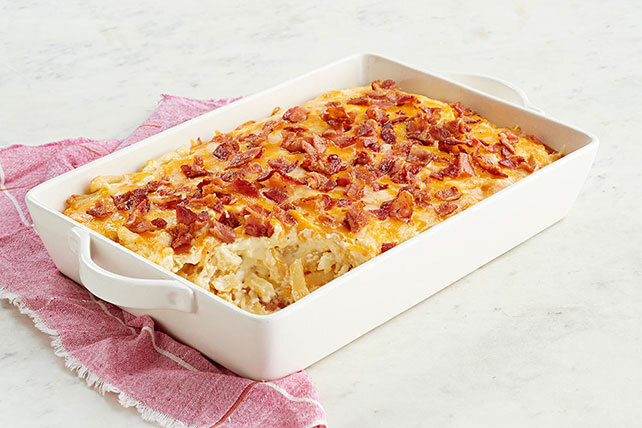 Layer half each of the potatoes, cream cheese mixture and shredded cheese in 13x9-inch baking dish sprayed with cooking spray. Repeat layers; cover. Bake 1 hour. Sprinkle with bacon; bake, uncovered, 15 min. Save 50 calories and 5g of fat, including 3g of sat fat, per serving by preparing with PHILADELPHIA Neufchatel Cheese, reduced-fat reduced-sodium condensed cream of chicken soup, BREAKSTONE'S Reduced Fat or KNUDSEN Light Sour Cream, KRAFT Lite Ranch Dressing, KRAFT 2% Milk Shredded Sharp Cheddar Cheese and 4 slices of bacon.